Missionary WF Schwarz (1842–1920), Finke River Mission 1877–1889. Pastors LG Schulze, WF Schwarz and H Kempe, first missionaries at Finke River Mission. Pastor and Mrs O Liebler (approx. 1910), Finke River Mission 1910–1913. 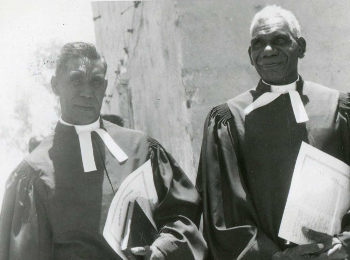 Pastors C Raberaba and P Bulla, the first Aboriginal pastors ordained at Hermannsburg (1964). The year was 1875. The government granted a 900-square-mile lease, which included part of the Finke River in central Australia. Negotiations with the Hermannsburg Mission Society in northern Germany eventually resulted in a number of new pastors being commissioned on 25 June 1875 and sent to Australia, two of whom were to be missionaries to the Arrarnta Aborigines. The others were to take up parish ministries in various parts of Australia. They sailed from Hamburg on 21 July (not much time to prepare! ), arriving in Adelaide on 16 September. The two missionaries were Hermann (AH) Kempe and Wilhelm (WF) Schwarz, who fortunately were tradesmen with skills that would serve them well both as they travelled and after they arrived. The church did not waste any time. The men were commissioned at St Michael's, Hahndorf in South Australia, on Wednesday 20 October, when the mission superintendent Pastor Georg Heidenreich preached on John 14:6. 'I am the Way. the Truth and the Life, no-one comes to the Father except through me'. 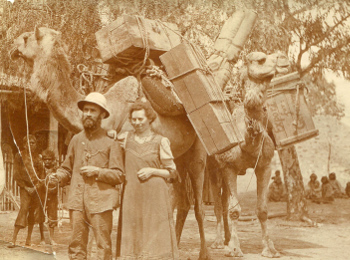 The men then left for Finke River just two days later. So, as the world went about its business, on Friday, 22 October, many Lutherans from Barossa congregations gathered at Bethany to farewell the missionaries. Children from the Bethany Lutheran School sang, 'Lead Thou Me On', then together with one layman, Mr Huebbe, the missionaries climbed aboard their horse-drawn wagon. It was rather late in the day, and before nightfall they travelled only seven miles to Siegersdorf (Dorienn) ... not really dramatic progress! On Sunday they rested and had a worship service in a local hotel. Was it perhaps the first 'pub church'? They could not know what problems they would face in the coming months. Within days of leaving they had horse trouble and had to buy a replacement animal. Once a wagon jack-knifed and a crate of eggs was smashed, so they gathered up what they could and for dinner that night they enjoyed scrambled eggs. So it went on, with difficulties usually far more dramatic than a few lost eggs. Their major challenges revolved around water and the weather. It was the beginning of a summer that was to be one of the worst white settlers had seen. The heat, dust, flies and horrific drought conditions plagued them within a week or two of travelling. Just past Melrose, they went through the Flinders Range at Horrocks Pass and when descending on the western side of the range, they were struck by blistering hot north winds. For the first weeks, Kempe kept a diary in which he described what they experienced. Sometimes the dust reduced visibility to only a few yards. They could hardly see their horses. They themselves had parched and blistered lips as temperatures soared to around 104 degrees Fahrenheit, day after day. Planning each day around the availability of water supplies for the horses was a constant struggle. They tried to sleep in a tent, but during the night the north wind blew it away. They then spent most nights under the wagon. Some nights the horses wandered far from camp and much time was wasted looking for them the next morning. They received some help from Superintendent Heidenreich, who met up with them on horseback and did what arranging of supplies he could. Still they struggled to find adequate water and feed for the horses, and they wondered why they were being tested in this way. When they were barely four weeks away from their starting point, and after already enduring enormous hardship and deprivation, Kempe wrote: 'Yes, often our courage nearly fails us. Often I have been almost tempted to exclaim in the words of the prophet: '"It is enough; now, O Lord, take away my life", for I am sick at heart. But, then again, I tell myself that we are in the Lord's service, that He has sent us and will always be with us. He will also know why He deals with us in such a way, and that everything is happening in our best interests, even though we do not understand His ways'. It was 27 November and they were barely 500 miles from Adelaide. For the remainder of their journey, they faced similar and still ever-increasing new problems. The drought was severe. Seemingly never-ending sandhills hindered progress. From the declining mission at Killalpaninna, they took over some 3000 sheep, plus other livestock, all of which made their search for water the more pressing. Details of the remaining months are too complex to adequately describe here, except to say that, when they reached Dalhousie Springs and found good supplies of water, they found also many others who were droving sheep and cattle and wanted to share the life-giving liquid. So it transpired that they spent over six months there before some rains came. Even then they could not move since they needed drovers to help them with the mob of sheep. Other livestock owners paid higher wages for drovers than the missionaries could afford, so they had to wait until the drovers had finished their better-paying work. So, eventually, only on 8 June they arrived at the site for their mission station. What might have been expected to take two months had taken them almost 20 months of gruelling travel through unimaginable country in stifling heat and waterless tracks. 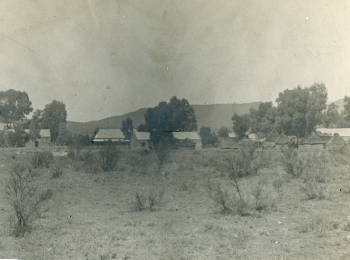 The mission settlement was named Hermannsburg after the missionaries' 'hometown' in Germany. 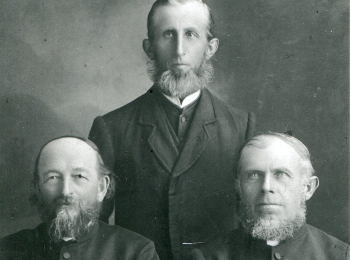 In April 1878 they were joined by a follow-up group from Germany, including Pastor Schulze. Initial contacts with the Arrarnta people were difficult but, by 1885, a school was started, a chapel was built, carols and a reading primer were produced in Arrarnta, mediation was undertaken with hostile white station owners, and seven teenagers were baptised. Despite these achievements, the early years were plagued with further hardships including isolation, illness, lack of medical aid, droughts, severe frosts, disappointing spiritual experiences, and unpleasant confrontations with local police as the missionaries acted to protect the people from exploitation and worse. However, the missionaries persisted with language learning, translation and teaching. Missionary Kempe compiled the first dictionary and grammar in the Arrarnta language. In 1891 the Hermannsburg Mission Society printed and published a volume for Christian instruction and worship in Arrarnta. It contained a catechism, Bible stories, psalms, prayers and 53 hymns. A thesis on the habits and customs of the Finke River Aboriginal people and the geography of the area was compiled by Missionary Schulze and published by the Royal Society of South Australia in 1891. 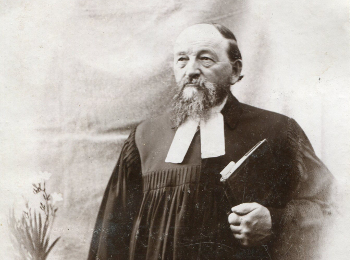 Other missionaries followed, most notable Pastors Carl Strehlow and F W Albrecht, who helped consolidate the mission with strong Bible teaching, reaching further remote peoples and the establishment of local industries. In 1964 the first two Aboriginal pastors were ordained: Conrad Rabaraba and Cyril Motna. Today 26 Aboriginal Lutheran pastors serve more than 45 communities in the 5 main central Australian language areas, supported by Finke River Mission of the Lutheran Church of Australia. The church gives thanks to Almighty God that, just as they had done during their journey north, the earliest missionaries kept at it because as Hermann Kempe said, '... we are in the Lord's service'. Inspiring indeed!